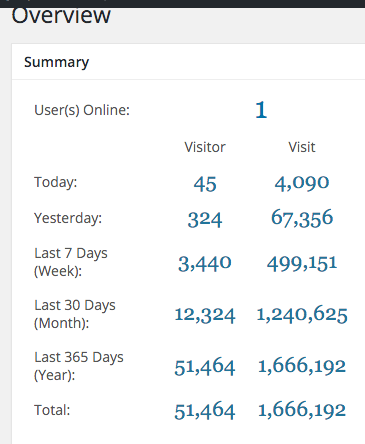 I just looked at the stats on one of my WordPress blogs and I saw these unbelievable numbers. To be honest, I just don't believe them. There is just no way that I had 67K visits yesterday! Anybody have any idea what might be causing these aberrant numbers? Also in the realm of unbelievable, there seem to be seven thousand comments all of which appear to be spam, all blocked by Anti-Spam by CleanTalk. 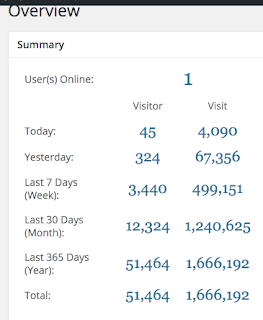 The WordPress Site Statistics on one of my blogs, Unbelievable! I got curious about this blog and decided to check out my Google Analytics which have also been set up for this blog. They're a much more reasonable number. This is for the same period. What the heck is wrong then with the wordpress statistics? I would guess from the fact that some bots are spamming the site and the high Wordpress visitor traffic that the WordPress stats counts the spam bots as visitors whereas Google Analytics does not. This is only a guess, I have no idea how to research this. BTW, I thought that I would peek at the statistics on this blog (ie Blorum.ifo, the blog that you are now reading). . It's of course a Google Blogger blog. Here's the Google blogger stats.